Top Gear returns next month, rejuvenated again, again, and there’s more good news—that silly ‘Star in a Rallycross Car’ segment is dead. It’s been replaced with a Toyota GT86. Things sound good. According to the announcement, the show returns to BBC 2 March 5th and BBC America Monday, March 12th*. 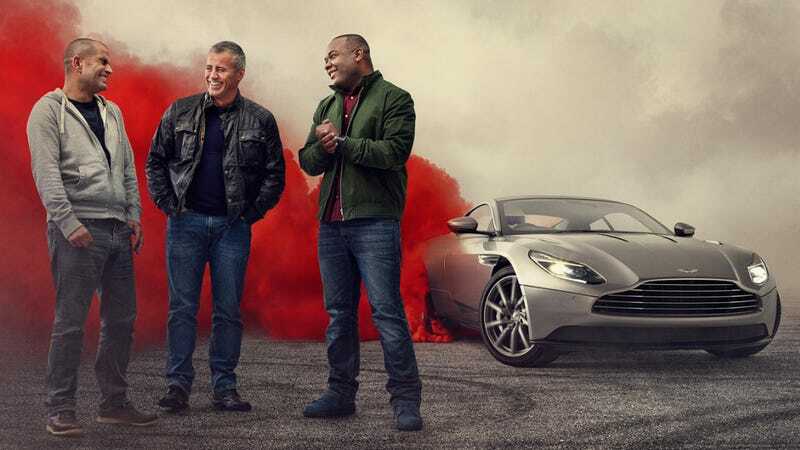 Coming to the rejuvenated show is the new leading lineup of Matt LeBlanc, Rory Reid and Chris Harris apparently laughing next to a bleeding Aston Martin DB11. The silly rallycross celebrity segment from last season apparently left with Chris Evans, and the new show has the stars tooling around the racetrack in a Toyota GT86, according to The List. I’m excited for the season. It seems the two main things the last series struggled with are gone and all traces of them wiped. The consensus around these parts was that Matt LeBlanc is good, Rory Reid is good, and Chris Harris is good. Also, the Toyota GT86 is good. Let’s hope the new show is the sum of these parts. This post and headline have been updated with the U.S. premiere date. Edit: This post and headline have been updated again with the changed U.S. premiere date. Come on, BBC!